Cams and mechanisms are all based on the same principle. The motion of an input axis is transformed to an output axis or translation. The transformation is a function of the input angle. This function is called the cam motion profile. 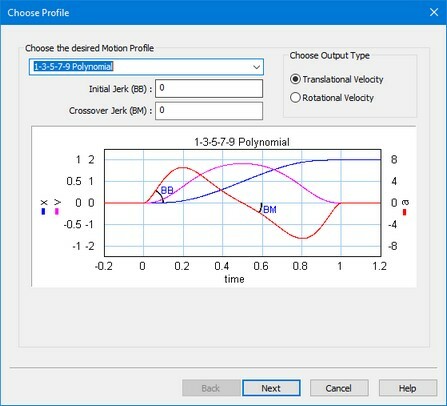 The 20-sim cam wizard helps you to generate cam and mechanism models. You can use various types of motion profiles which are continuous in velocity, acceleration or even in jerk! An example of a mechanism that can be generated by the Cam wizard is the crank-rod mechanism, where a rotary input motion is transformed to a translating output motion. • The models describe the output velocity as function of the input velocity but also the input torque as function of the output load. • The speed of the input axis does not have to be constant nor does the output load. • No inertia, stiffness or other dynamic behavior is included, but this can be easily incorporated by coupling elements from the 20-sim library (inertias, springs etc.) to the input or output of the model. 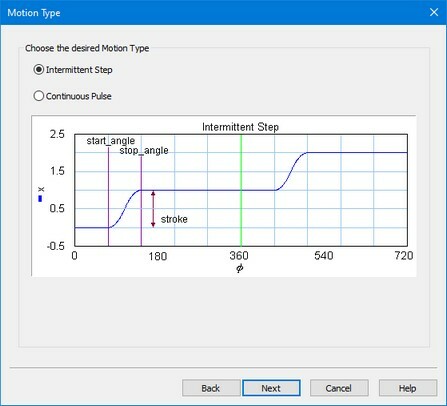 To generate a cam or mechanism model in 20-sim, follow the next steps. 1. Open the model library and drag the model CamManipulator.emx to the editor. 2. Make an input connection (rotation) and an output connection (rotation/translation) to the model. 3. Select the camwizard model and click Go Down. Now the wizard will be opened. 1. If you have changed the settings of this wizard, you have to process the model first (from the Model menu, choose Check Complete Model) before the changes become effective. 2. 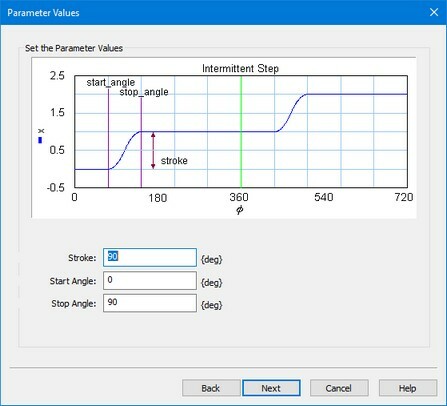 You can change parameter values during simulation (from the Properties menu select Parameters). 3. 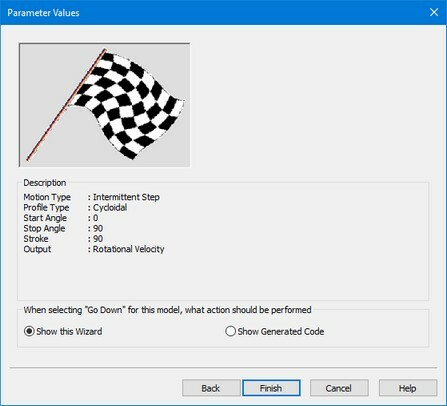 This is a masked model that uses the dll-file MotionProfile.dll to open the wizard. This dll-function must be stored in the bin directory of 20-sim. To see the SIDOPS code of a masked model press the shift-key, while clicking the Go Down command.